It's been quiet on the news front for some time on here. We've had our reasons. Check our writer Henry's blog to read why. Road tripping down to London today. If we're passing you by say hey! 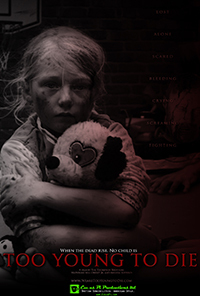 Fingers crossed when we get back this movie will be one step closer to being put into production! more information about possible litigation coming soon. We can't discuss it just yet, but something has come to our attention which we are trying to be civil about. There is a slim chance this may need to be taken up by the court. Will discuss this publically as soon as we can. We have the promise of some of the budget and are that little bit closer to our goal! We're not there yet so keep rooting for us. We're still going. We may have secured our locations for much of the movie, we're still working on the finance part! Always the hardest part. We need all the help we can get to get over that hurdle of being broke. Everyone wants to see the movie and we have quite a few supporters - but we are not at our goal to make the film yet. We're still working on it and don't forget about us. Donate if you can and share and like our twitter and facebook and don't forget we are still here. It's only a matter of time! Hey everyone, check out the teaser trailer for our new up and coming original horror drama! How exciting is that?! If you like it please visit, comment and SUBSCRIBE to our official YouTube channel. Thanks guys! There is a good group of local filmmakers in the North East who meet up every month and talk movies and try to get productions off the ground. These fine fellows Support Too Young to Die and want to see this film get made! 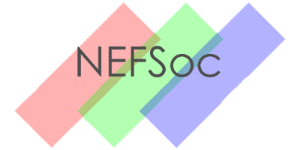 Thank you North East Filmmakers Society! It's been an incredible year. We've went from complete obscurity to having some fans and some attention. If we can keep moving forward the same way, we will bring you this nightmare! For everyone to enjoy. Thank you all for all of your suppor this year. We are now also sponsored by MFA Bowl Newcastle! Thank you very much! Local business support is something we are always apprecitive of. A piece of fantastically good news as far as financing our film goes; NO FEAR clothing company is SPONSORING Too Young to Die! Hopefully this is the first of many companies who will be contributing to the film, through funding or products. One step closer to making this movie! We're still hard at work trying to pay the bills. Coming soon, some new footage and showreels as well as more information on some new projects we're working on in conjunction with Too Young to Die. 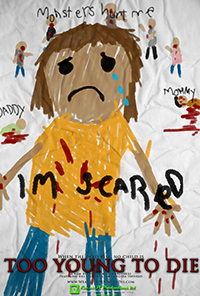 Two new prototype posters for TOO YOUNG TO DIE here. Check them out! We love feed back, so by all means let us know. Scary? Lame? SUPER AWESOME? let us know. We're still here. Working away. "Why does everything in this business always take so long?" Because it's hard work to sell dreams! Bear with us. the Grave Podcast interview is live: Episode 19 - sign of the cross! Check it out HERE! Wayne and Henry have done an interview with the Grave Podcast crew about Too Young to Die and horror in general. Check it out when it goes live on the 25th of June here! 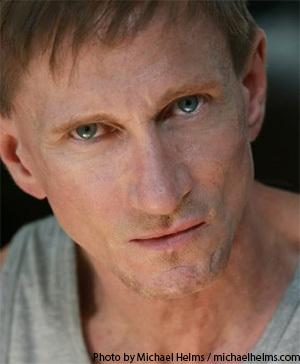 Actor Bill Oberst Jr. Has signed an intent to play Mr. Conners in our film Too Young to Die. We've very excited about it! Bill said: "I am delighted to be a potential part of this innovative project... I'd pay to see this movie!" How cool is that?! So, the Too Young to Die indiegogo campaign has come and gone and was kind of a massive failure. Kind of in the sense that we did not raise our goal - not even 1% of it! However, it was also a fantastic learning curve for us and we received a lot of great press and gained a lot of new fans. While this venture didn't take off in this way, the movie will still be made and is still coming. We're just looking to different roads to go down for it. Also, to those who DID contribute some cash on the campaign, don't worry for the extra delay in getting your movie we have a few plans to reward you guys good and proper for your support. It means a lot to us and we won't forget it. Only one week left to make a difference to our indiegogo campaign! Please check it out and tell your friends. Over the last two weeks, we've been featured in more than 20 press articles and have been getting a lot of positive support. Check it out in our press section! We've been featured in the SUNDERLAND ECHO. Check it out! - Local pride! A few more pieces added to the PRESS section, including being featured on Horror Mansion. Our film has been featured at Brutalashell! Check this awesome write up out! The teaser trailer for Too Young to Die has also been featued on Decay Magazine's website! Also, we've now had over 90 survivors and 80 zombies take our SURVIVAL TEST. We are still looking for ARTISTS. Our talented VFX artist Ben Douglas has posted a new tutorial video showing how to deform a 3D zombie! Our Henry Thompson has had an interview with Interrograting ideology with a chainsaw, check it out! Our Wayne Thompson has had an interview with SUN FM, check it out! We now have over 100 followers on twitter! Thank you for showing the support everyone! keep spreading the word and telling your friends, means a lot to us. Our Indiegogo campaign is live! Please, tell your friends and help us bring this nightmare to life! If you contribute even 1 buck and you will be a part of bringing this groundbreaking film to fruition. www.WeareTooYoungtoDie.com is live! Our facebook is live! Our twitter is live! We are live!